Kalvin Phillips gets stuck in on his debut for Leeds United against Wolves. Everyone should have known better – it seems there is no such thing as a quiet time at Leeds United when football on the field does all the talking. Just when it seemed everyone was finally singing from the same hymn sheet and the future was beginning to look more positive and settled along comes another own goal to potentially derail everything again. The suspension of assistant coach Steve Thompson last week, without official explanation, overshadowed the Whites’ two Easter games and almost made them irrelevant in the face of head coach Neil Redfearn admitting he felt he had been undermined and was thought to be considering his position just when it seemed he had proved he was the man to take the club forward on the field. The improvement of the team since the turn of the year was being put in jeopardy and whether or not the absence of Thompson had any effect it was not lost on fans that Leeds promptly went back to their bad old ways to suffer back to back holiday defeats. They are relieved their side already had enough points in the bank to feel safe from relegation because a complete collapse for the remainder of the season is not beyond the realm of possibility. 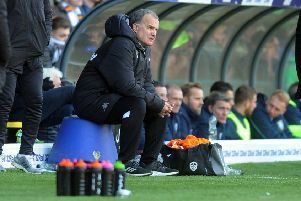 In the absence of an explanation all sorts of wild rumours were being passed round Elland Road at the weekend with all the sympathy on the side of Redfearn, who received total support from the stands on Saturday despite the side’s 3-0 home defeat to a Blackburn team there for the taking because of their impending FA Cup replay against Liverpool. If he does leave or is forced out it will be a brave man who follows him as head coach and a big decision for the owner, who cannot afford to get his next appointment wrong after the kind of upheaval caused this season because David Hockaday and Darko Milanic were taken on and quickly found to be up against it. Whether Massimo Cellino’s explanation to a national newspaper on Monday that Thompson was relieved of his duties because of something he is alleged to have said to sporting director Nicola Salerno after the game at Fulham will settle the matter is open to question, but Redfearn remains as head coach for now and will get on with preparing the team for back to back home games against Cardiff City this Saturday and Norwich City next Tuesday. Leeds may have little to play for, but fans will be keen to see good displays against a Cardiff side they always seem to struggle against and against a Norwich team that could include former Whites favourites Bradley Johnson, Luciano Becchio and Morley lad Jonny Howson. Redfearn, meanwhile, has declared his intention to stay in charge until the end of the season and was pleased with the way his players stuck at their task against promotion challengers Wolves on Monday. Although Leeds lost 4-3 they showed their resilience once again to give their hosts a real fright before Dave Edwards’ late header gave them the points. “The disappointing thing is four goals. If you score three goals away from home you expect to win, never mind get a point”, said Redfearn. “But they showed a determination and a desire to get back in it and if we play like that, with that desire, determination and will to win we’ll win far more games than we’ll lose.